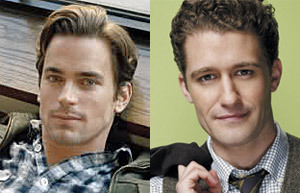 Towleroad has learned that Matt Bomer, star of the hit USA drama, White Collar, and Matthew Morrison, who plays Mr. Schuester on the popular show Glee, will play plaintiffs Paul Katami and Jeff Zarrillo, respectively, at the March 3 west coast premier of Dustin Lance Black's play, 8, in Los Angeles. The American Foundation for Equal Rights, the organization sponsoring the plaintiffs' legal team in the federal challenge to Prop 8, could not be reached for comment. Earlier this week, it was announced that George Clooney would be playing the part of attorney David Boies. Black's 8, which already had a successful premier in New York, is based on the transcripts from the trial proceedings before Judge Vaughn Walker in Perry v. Schwarzenegger (now captioned, Perry v. Brown). As you will recall, Judge Walker declared Prop 8 unconstitutional, and we expect the Ninth Circuit to issue its ruling any day now. Stay tuned for news updates and legal analysis of the upcoming decision.